Scotland have proved they can beat Australia in attritional arm-wrestles and get within a point of them in a ding-dong eight-try classic but can they go toe-to-toe with them on a dry track and emerge victorious? That question could be answered at BT Murrayfield today as the nations meet for a 30th time in what are forecast to be dry, bright and relatively mild conditions. The caveat with that one being that they scored three tries to the Aussies’ five and the last two of those came from a charge down and an intercept ion as the heavens opened over Twickenham. Scotland attack coach Jason O’Halloran said yesterday that he believed skill levels are improving and that they can hurt the Wallabies out wide. “We’ll find out tomorrow,” he said. “I’d like us to be playing on a dry track. I think the weather forecast is on the improve. We want to continue to get better as a team and play a good brand of rugby. At the same time, we don’t want to put pressure on ourselves by playing too much in the wrong areas. “I’m really thrilled with how our two Pro12 teams are developing. Glasgow have always had that attacking mindset, they play an attractive brand of rugby. Now we see Edinburgh starting to go that way as well under Hodgey [interim head coach Duncan Hodge]. 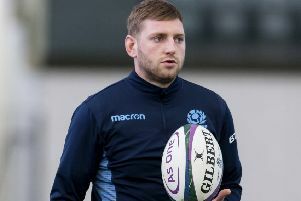 Stuart Hogg is Scotland’s most explosive attacking weapon and the Six Nations player of the tournament says he has loved working with O’Halloran, who will join him at club level as part of Dave Rennie’s new Glasgow coaching team next season. Hogg is relishing the chance to work in tandem with Stormers centre Huw Jones, who is earning his second cap today, in attacking that 13 channel. “Huw’s slotted in really well. He’s made a few cracking outside breaks in training where I’ve struggled to keep up with him. It’s good for us that he’s doing that. “He brings something a wee bit different. He has a good kicking game as well so I’m excited to see him giving good ball for the outside backs.” Much attention will be on the two No 15s today, with Hogg’s opposite number Israel Folau earning his 50th Australia cap, and the Scot is looking forward to sharing the stage with such an exciting talent. “He’s been very impressive. I’m a big fan of Israel Folau,” said Hogg. “I look at his games very closely to see what I can learn off of him. The aerial skills he has, he gets up so well for a big man and we need to shut him down in attack. O’Halloran certainly believes the near sell-out crowd is in for a treat today with the likes of that pair on show. “He’s an outstanding player,” the Kiwi said of Folau. “Between him and Hoggy, there are going to be a couple of outstanding full-backs playing. “You have to be very careful how you kick against Australia. If you give Israel Folau time and space, he can do a lot of damage. “So the quality of our kicking game is important, as is the quality of our chase and our one-on-one tackles, trying to minimise his impact.